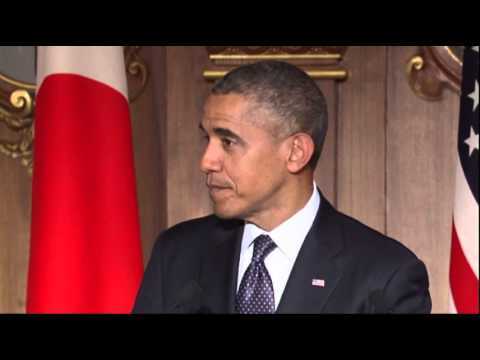 Published: April 24, 2014 12:00 am Updated: April 24, 2014 8:56 a.m.
TOKYO — Accusing Russia of failing to live up to its commitments, President Barack Obama warned Moscow on Thursday that the United States has another round of economic sanctions "teed up" — even as he acknowledged those penalties may do little to influence Vladimir Putin's handling of the crisis in Ukraine. Obama's frank pessimism underscored the limits of Washington's ability to prevent Russia from stirring up instability in Ukraine's east and exerting influence over elections scheduled for next month in the former Soviet republic. A diplomatic accord that offered a glimmer of hope for a resolution to the tense dispute is crumbling, and Russia has warned of a firm response if the country's citizens or interests in Ukraine are attacked. With no appetite in the U.S. for a military response, Obama is largely banking on Putin, the Russian president, caving under a cascade of economic sanctions targeting his closest associates. But the success of that strategy also depends on European nations with closer financial ties to Moscow taking similar action despite their concern about a boomerang effect on their own economies. "I understand that additional sanctions may not change Mr. Putin's calculus," Obama said during a joint news conference in Tokyo with Japanese Prime Minister Shinzo Abe. "How well they change his calculus in part depends on not only us applying sanctions but also the cooperation of other countries." The president's comments came one week after Russia signed an agreement with the U.S., Ukraine and Europe that called for pro-Russian forces to leave the government buildings they have occupied throughout eastern Ukraine and allow international monitors into the region. But there's been little indication that Russia is following through on its commitments. "There was some possibility that Russia could take the wiser course after the meeting in Geneva," Obama said. "So far at least, we have seen them not abide by the spirit or the letter of the agreement." The president said the U.S. has crafted a new package of sanctions to punish Russia for failing to follow through on the Geneva accord, but he stopped short of saying he had, in fact, decided to move forward with those penalties. "There's always the possibility that Russia tomorrow or the next day takes a different course," he said. "Do I think they're going to do that? So far the evidence doesn't make me hopeful." Echoing comments from other officials in Washington, Obama said a decision on the sanctions would come in a matter of days, not weeks. That timeline would appear to put the decision in the midst of Obama's eight-day Asia trip, which also includes stops in South Korea, Malaysia and the Philippines. The pending penalties on Russia are expected to target wealthy individuals in Putin's inner circle, as well as the entities they oversee. Although U.S. has also threatened to levy potentially crippling sanctions on key Russian industries — including its robust energy sector — officials say they only plan to employ those tougher penalties if Russia moves military forces into Ukraine. The U.S. and Europe have already issued asset freezes and visa bans targeting Russian and Ukrainian officials in response to the Kremlin's annexation of the Crimean Peninsula. But those penalties have appeared to do little to convince to Putin to avoid fomenting unrest in eastern Ukraine, where the U.S. is accusing Russia of fomenting unrest. On Thursday, the Ukrainian government and pro-Russia insurgents reported at least two deaths on the pro-Russia side during clashes in east Ukraine. The fighting was the first since Ukraine's acting President Oleksandr Turchynov on Tuesday ordered the resumption of military operations to root out the pro-Russian forces. Putin has denied that his country is the guiding force behind the insurgents who have occupied government buildings in nearly a dozen cities in Ukraine's east. Russian officials have instead focused their attention on the forces Ukraine's government has sent to the region in an effort to counter the occupying insurgents. "If our interests, our legitimate interests, the interests of Russians have been attacked directly, like they were in South Ossetia, I do not see any other way but to respond in full accordance with international law," Russian Foreign Minister Sergey Lavrov said Wednesday. He was referring to the 2008 war that led to the breaking away of the Georgian republic of South Ossetia. In that conflict, Russia launched an invasion of Georgia after it unleashed an artillery attack on the capital of the separatist region, where Russian peacekeeping forces were stationed.